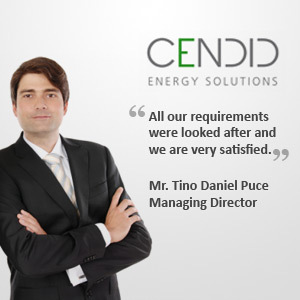 Tell us more about Cendid Energy Solutions. Cendid Energy Solutions is an energy engineering service provider that aims to help industrial clients or plants reap energy cost savings whilst cut down their carbon emissions. Cendid has a holistic approach to our clients’ concerns. This includes a thorough diagnosis of the issues, design engineering and concept development of the solutions and finally, to provide the installation. Why did you set up your presence in Singapore? There is a huge demand for energy reduction and efficiency services in Asia. Prior to this, we were based in Freiburg, Germany and constantly had to fly out to meet clients across Asia. So, we decided to have Singapore as a hub to serve our clients in the region. Furthermore, Singapore has the best business infrastructure in South-east Asia. Through our Singapore hub, we want to serve our clients in Asia. In the long term, we want to expand our team and employ local professionals who can conduct the business for us in Asia. We also want to explore the markets in the region and help our clients reduce their carbon footprint sustainably. In the process, we look forward to a solid and improved customer base. Overall, our experience was very good. We have searched online for incorporation services providers in Singapore and contacted several companies for support via email. We found that Rikvin replied the fastest and in the most comprehensive way. All our requirements were looked after and we are very satisfied.